I′ ve just provided you with lots of ideas and information about how you can get backlinks just being creative and consistent. Currently, one of the most popular and effective link building tactics is guest posting. And that′ s what I′ ll tell you about in this chapter. However. using the methods I describe here, alongside searching for blogs offering guest posting opportunities, you may search for other resources to place a link. "Submit a guest post"/"Submit post"
I recommend using quotes in a query to find most relevant results. 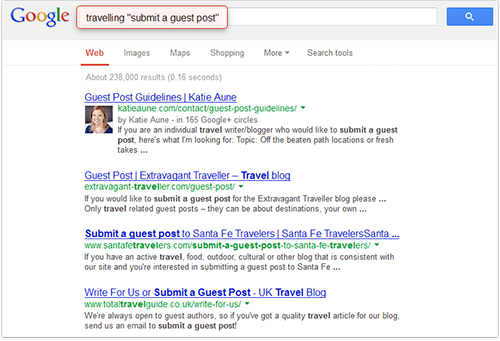 For example, a query may look like this: travelling "submit a guest post". Some invitations can be slightly different. For example, a blogger may write "Become our contributor" instead of "Become a contributor" or "Submit your post" instead of "Submit post", but these blogs will be filtered out because the quotation marks instruct Google to search for exact match. inurl:category/guest_your keyword will find the blog posts which have been categorized as "guest" and that also contain the keyword relevant to your site. 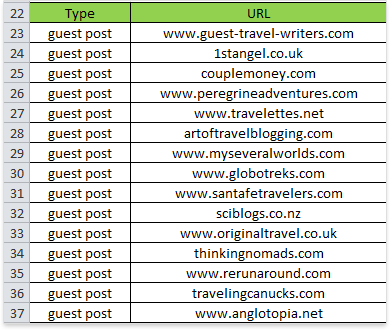 But if a blogger has not put all the guest posts in a separate category, there′ s another query you can try: inpostauthor:guest_your keyword will find the blog posts where there is an author called guest, guest post, guest contributor etc. <Your keyword> + intitle:"Submit guest post" OR intitle:"Submit an article" OR intitle:"Write for us". After that Google will come up with a list of websites where you may potentially host your guest post. DO IT NOW! Go to Google to search for guest posting opportunities using different keyword combinations. And don′ t forget to start a new Excel sheet to keep record of each resource. Enter the sites you just found, one per line (like I did in the sample list below). Step 2. Choose only HIGH QUALITY, complementary sites. You need to check at least those most important Q–factors I was talking about before that help you decide on the quality of links from prospect websites. As any of the choices we make every day, we have to choose link partners smartly. Like when I was in Santana Row for a pair of black shoes, I didn′ t buy the first pair I saw. At least they have to be Size 11 width EX. Then do they match my suit? Does the leather look as it′ ll wear long? Does my wife Linda like them after all :) This all seems to matter. The same is true for backlinks: Apply a number of factors to choose the right sites for links. Besides the factors listed in Chapter 4.7, you may as well check others which are important for you. For example, I check the number of website pages in Google′ s index (the more relevant pages — the better), number of social signals and the quantity of linking domains (if other websites link to this resource, it is probably popular and useful). Here′ s an example of what your spreadsheet may look like after you fill it in (all figures are imaginary!). No doubt, searching for all these data and filling them in manually can be pretty boring and take a lot of time. If you want to spend your time on more useful activities, go directly to the chapter 5.4 "The winning tool that finds best link opportunities" and read about the tool which will do all that for you. DO IT NOW! Look at your potential partners like you′ d look at a pair of shoes and decide if that′ s exactly what you need. In today′ s world there are two most popular ways to contact a blogger: e–mail or social. First and foremost, try Google Search. If you know the blogger′ s name or username, Google may provide you with the necessary contact information. http://whois.domaintools.com/. Besides all of the basic information of a website, here you can also find the contact details. However, you should be aware that here you′ ll see the e–mail of the registrant of the site, who is not necessarily the author. Luckily, with blogs this would rarely be a problem. E–mail the blogger a short, friendly note. First of all, if there are precise "guest post" guidelines on the website don′ t even think of writing another letter just to introduce yourself and to say you′ d like to be a guest author. Do that only if the guidelines say so, because otherwise you′ ll just waste a blogger′ s time, not to mention your own. Write a post in compliance with the guidelines and send it alongside short information about yourself and your website. This will demonstrate that you value the blogger′ s time and have spent a couple of extra minutes to examine the website you′ d like to post on. If there are no such guidelines and you haven′ t found any articles written by "guest authors", you have no choice but to ask whether a blogger accepts guest posts at all and what he wants in exchange. As you′ re offering a blogger valuable content, make sure it is conveyed by the e–mail. Do not pitch it as a favor. As for the subject lines, use something like: "Guest Post on [blog name]", or "An infographic that may be of interest to you"or "Content suggestion for [blog name]". You e–mails should be personal. If possible, address the blogger by name. Don′ t write too much and if you can genuinely praise something on the site, please do. Tell a blogger why placing a guest post will be beneficial for the both of you — this helps you look more personal and trustworthy. After reading your e–mail a blogger should have a clear idea of what you need and what you offer in return. Here′ s an example of such an e–mail. I recently came across your website and read the post about your last trip to Thailand. I really liked the photos you made and all the useful advice you provided on how to see the world and spend less money. I am a traveler too and I′ d be glad to share my advice on how to save money when travelling. I′ m thinking about a post named "15 Free or Cheap Ways to See the World". Please let me know if this sounds interesting. If not, I can send you other post ideas. "I would love it if you could take a look at [your software tool]. I think that a review would be a perfect fit for your blog and audience. If you are interested, I would be more than happy to send you a free copy of [your software tool]". However these are just samples, to show you the main points that are good to mention in an e–mail. But I′ m sure you′ ve got your own tricks to convince people into doing you a favor. And let me repeat once again, as this is really important. Be personal when you e–mail bloggers. You should understand that guest posting is a win–win, so you need to have something to offer, to get a link back. Of course this "something" can be a high Google PageRank, or good traffic flows — but in our case the #1 thing that matters is quality content. If your guest post is useful and might be valuable to the visitors of a Jack′ s site, the Jack might pretty well link to you — why not? And don′ t ever get desperate at the very start. It′ s never easy, but as soon as you get over the beginner′ s challenge, you′ ll be surprised at how fast you gain speed. Keep record of sites you′ ve found. Start an Excel sheet and put down who you′ ve contacted and who you haven′ t yet, who agreed and who refused to post and so on — as you′ ll be getting down to these records all the time. With hundreds of potential blogs, you may easily send two e–mails to the same person by mistake, or forget to send a couple e–mails — so keep records to avoid this. DO IT NOW! Start from looking for new backlink resources and select the best ones. And as ever, there are ways to make any job faster and easier. This time, software′ s at your service to make link building as easy as winking. The link building techniques explained here are very effective. Thanks for sharing with us. This is the SEO Bible. Nowadays, Google targets sites using Private Blog Networks with manual action ranking Penalties. Frankly speaking Google will not ban you for naming your Link Directory a "Directory", but if you rename it to "Partners" - it will look more natural. Where do you put links if you have a blog? Would it be a separate page created or in a blog roll? I would recommend you to create a separate webpage on your blog and put all the backlinks to this page. They all will be concentrated in one place and will not draw away the attention of the website readers. I made a separate page on my website for links to partner websites, I called my page Partners because I heard that if you title the page as "links", google will not like it, it this the case? It will take lot of time.But it can be effective, it will really pay off. I have been putting off link building for some time now. It sure seems like a long process - curious how Link Builder helps and would like to see more about how to use the software Specifically. Most of this blog seems to be very high-level, what I'd like to see is a "Follow these steps" and just 1,2,3 my way into using Link Builder - am I missing something? You will find the instructions on the use of LinkAssistant in the on-line help. To run it you should open the software and click Help-> Online Help or press the F1 button. This seems like a long and tedious process. I'm assuming LinkAssistant will take care of this. On Google search result page we get lot many websites. Coould you please suggest me a way by which I can get a excel sheet of all links without making it manually? If you have such software please let me know about it. I would be pleased.